I’ve written a few horror stories over the years. I find horror an interesting genre to try and write in. The thing is, so many horror shorts seem to be focussed on supernatural aspects or monsters but those things don’t really scare me. I get scared by things that can happen to us in real life. Murders, attacks, intruders and the such. Most scary to me is the idea that our own minds can turn on us and change our reality to no longer match that of those around us. I have a couple of stories in the works trying to explore that theme. Try Everything Once started to form in my mind a while back when I read an edition of Horror Sleaze Trash. After it took form, I wrote it down and then forgot all about it, figuring it was too far away from anything I wanted to share with people. But after sharing Can I Join In? I think anything goes from now on. When I was updating my Goodreads last night I was adding Horror Sleaze Trash and remembered this piece existed. So after digging it out and doing some minor edits, I figured it was worth sharing. 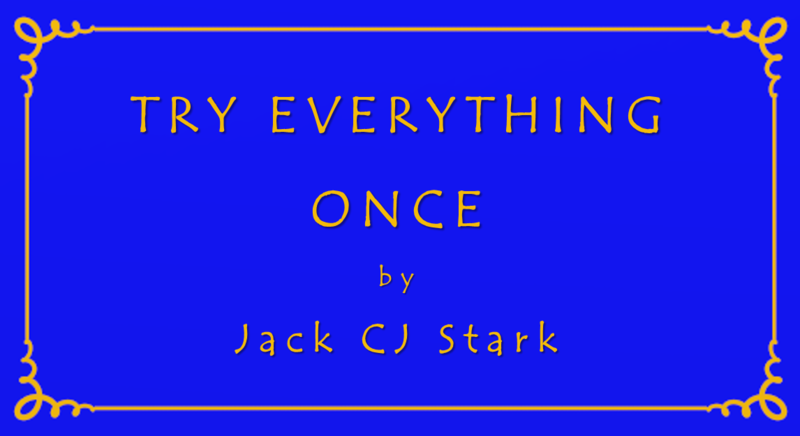 Try Everything Once by Jack CJ Stark. I’m not sure if it is a story that can really be enjoyed, but I hope it stirred some emotion in you. That’s all one can really hope for. Anyway, I’m off to throw away anything I haven’t used in a while. Until next time, Peace and Love! Whoa, Nelly- this is punchy! It certainly did snowball into something dark and sinister! Very well written!